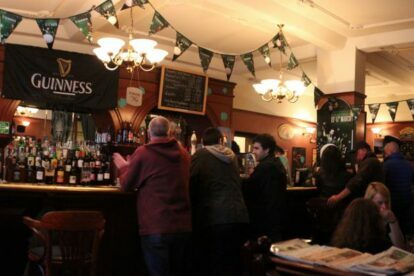 One great pub has already been written about: check the Patrick’s Pub review. I like Sir William’s much more. I may drink literally anything I want, because I can choose from more than 160 different beers from Ireland, England, Germany, Belgium, Slovenia and many other countries. Not to mention 30 different wine and whiskey brands. In spring it becomes a vivid environment boasting with talks about what a truly good pint might be. Their specialty is the monthly organized beer tasting. It is an extraordinary occasion taking place every last Monday of the month. You pay €16 and get the chance to try out 6 different beers, listen to the explanation about their origin, brewing process and taste, just like a real enologist. My suggestion is to ask the barmen for their recommendation, they will not let you down, especially with the growing number of micro- and home-brewed craft beers that are becoming quite a hit thing in Slovenia.